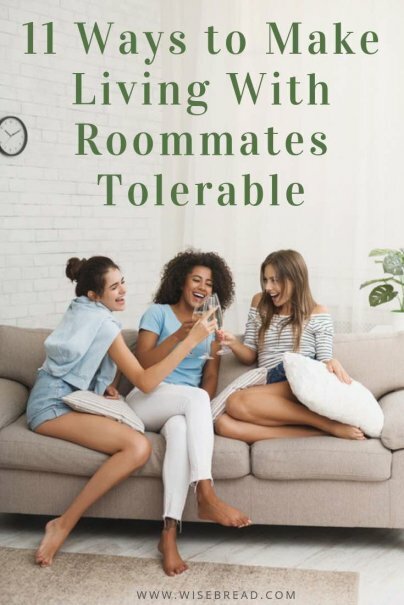 Living with roommates is a frugal choice, and, especially in an economy where living expenses are growing more rapidly than paychecks, it's often a necessity. But that doesn't mean it's always fun. Even the best of roomies sometimes run into rough patches. Here's how to keep a shared household running smoothly. Get to know the folks you're moving in with as much as possible beforehand to make sure your living habits are compatible. Make sure you like the space and the way it is (or is not) kept up, because that's how it will be when you move in, too! Whether you're interviewing a roommate for your place or you're the one being interviewed, it's easy to feel like you want to impress. Instead, ask all of the questions you're wondering about. Answers to questions like: "What time do you get up?" "What time do you go to sleep?" and "Do you always have to turn on the lights?" can make the difference between a peaceful roommate relationship and one that is stressful for everyone. If you want or need something from your roommates, ask for it clearly. It's easy to be frustrated with someone who inadvertently wakes you up every morning, but if you never explained that you're now working the night shift, you can't really blame them. That's not to say that your roommates can (or should!) acquiesce to your every request, but you won't even be able to have a conversation about it if you aren't clear about your own needs in the first place. Many, many roommate conflicts have to do with differing ideas regarding space. Some people think it's okay to walk into any room where the door isn't locked, while others would appreciate a knock even if the door is open. Most assume they can leave their stuff in a shared space, while a few want that space kept sparse when not in use. Articulate your needs and wants regarding space and ask your roommates to do the same. If there's a conflict, decide together on how to proceed. When everyone has to write a check or come up with the cash to split every individual bill, it's easy to get overwhelmed or forget to pay something. Instead, if you can swing it, designate one roommate the CFO for the house, and maybe give them a discount on rent, for the time they're putting in. Have them pay the bills for the month, then let everyone know how much they owe. When everyone is only paying once, it's easier to have everything covered. Whether you split up cleaning so everyone does something each week, or everyone takes a week, it's better to make a plan than to just assume everyone will do something. Because, you know what? They won't. Most people will walk right by a mess unless they know it's theirs to clean up. So plan your cleaning and avoid conflict. Spend some time hanging with your roommates. When you know people as friends, and not just as that guy from the other room, it's often easier to live with them. Understanding how they are and why they are that way will help when a difference of opinion arises. Whenever human beings are living and working together, there is going to be some sort of conflict. That's just the way it goes — whether you're in a roommate relationship, hanging out with friends, or in a marriage. When you think about it this way, it's easier to remain calm when conflict arises and to deal with it in a healthy, adult manner. If something comes up for you or changes in your life, let your roommates know, and ask them to do the same for you. Whether that means you might be moving or that you won't be able to clean the basement this week, letting your roommates know ahead of time will reduce feelings of betrayal or anger. Food can be a huge source of conflict for roommates. There are a million ways to deal with it: everyone buys their own, everyone shares, some things are shared and some aren't, etc., but don't just assume it will be one particular way. Figure out what works best for everyone and then be consistent. Most of us know how we would want to do things if we had our own home all to ourselves. When you live with roommates, though, it almost always means that no single person has everything they want. If you know going in that you are going to need to compromise — and compromise a lot! — it will be easier to let some things slide, to speak up about what is important to you, and to figure out how to live life together.